This is a long-standing Bay Area band that plays Mezzacappa’s compositions, but the same people (including Mezzacappa) also form the band Go-Go Fightmaster, another awesome slice of free jazz. But Go-Go is more slash-and-burn, while Bait and Switch is rooted in the free jazz of Henry Threadgill and Eric Dolphy (two choices among the influences Mezzacappa lists in the liner notes). Songs here do include untethered free improvising, but many of them are cemented by swingy heads that recall the best of ’60s/’70s jazz. John Finkbeiner’s guitar certainly reaches beyond jazz, especially when he adds distortion and fuzz, as in his solo on “Zzllzzpp.” Aaron Bennett’s subsequent sax solo on that track might sound friendly and swingy, but it’s accompanied at first by a bumpy bass (Mezzacappa) and drums (Vijay Anderson) rhythm, and later by an evil and raucous set of riffs from the band. For cover songs, you’ve got nonobvious choices. Captain Beefheart’s “Lick My Decals Off, Baby” is appropriately stabbing and buzzing, with a head that’s got an infectious rolling swing to it. “I’ll Be Right Here Waiting” is a composition by Steve McCall (drummer of the trio Air, among other groups), turned into a reverent bass solo. A couple of quieter tracks later in the album, like “Catalypsoclysmic,” are a treat. Then, near the end, there’s “What Is Known,” where the band really blows off the doors, creating a wail that draws back on the passionate, political style of free jazz. Here are two takes on a bright, catchy song called “The Aquarist” — one from Sacramento’s In the Flow festival, and one from a house concert. It’s got a bright, swingy theme and some space for sax and guitar solos. You can also catch early recordings of Bait & Switch songs on Mezzacappa’s Myspace page. … And, if you care, I saw this band live about a year ago. Really glad that they found a good home for their first album. You’re about to hear a lot more about Bunky Green. In a genre (free jazz) where undiscovered greats are the norm, Green has been an even newer discovery than usual, for me at least. He’s 74, so he’s no tenderfoot. Yet, he escaped my radar until early this year, when a Do the Math blog post by Ethan Iverson all but dared listeners like me to seek out Bunky Green. Later this year, Green is going to get some serious publicity, following an album he’s releasing with Rudresh Mahanthappa on the Pi Recordings label. Mahanthappa and Pi are darlings of the college radio and NPR sets. Their stuff doesn’t exactly make the background music playlist at Target, but it gets heard and gets distributed. It gets found. I can understand why some mainstream audiences might not like Green. He sets up a club-jazz backdrop: airy piano chords, richly grooving bass — traditionally progressive stuff — and then blasts diagonally across it all with some ferocious soloing. It’s quiet-night-out music with an asterisk. A chill-out lounge with labyrinth wallpaper. Green’s solos are a delight. He’s lightning fast and deadly accurate, with a pillowy, breathy sound articulating each note in every impossible run — a masterful, light touch amid the bluster. Not everything dimension-jumps into futuristic, Steve Coleman territory. Green plays by the regular rules when it suits him, and it still sounds like him. I managed to learn a little bit about Green by thumbing through the KZSU vinyl library. He’s not an avant-gardist per se; he’s more an adventurous, hard-thinking straight-jazzster. His album Testifyin’ Time, from 1965, is quite straight and swingy. Places We’ve Never Been, from 1979, has more of the tilts, angles, and surprises I’d expected. I remember the opening track, “East and West,” being a treat. But the album also has “April Green,” a mellow flight in that ’70s kind of chill vibe that I just can’t take. Overall: Thumbs up on Bunky Green, as a musician and as a discovery. Can’t wait for that CD. Meanwhile, I’ve also listened to his 2008 Salzau Quartet recording on Traumton, which deserves a separate blog entry. 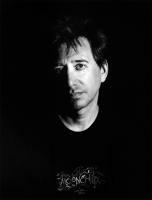 Yoshi’s SF is hosting another John Zorn residency — only three nights compared with last year’s five, but still a trove of great music waiting to happen. There’s a Zorn mailing list, in existence since the ’90s, where folks recently debated Zorn’s move into more melodic forms — i.e. normal-sounding music. He’s always done some of that, whether through soundtrack work, Masada, or even Naked City (“Inside Straight,” from their first album? Killer.) But some of his stuff lately has gotten nice — really nice — like the sugary jazz goodness of The Dreamers, the band I saw last year. But his improvisations remain biting, chopping, and out-there. A trio with Laurie Anderson and Lou Reed alienated a Montreal Jazz Festival audience, as has been widely documented. (And it’s sad to see the ignorant comments on Spinner about the show.) To most of us, that’s good news. For this weekend’s shows, you have no excuse — not only am I telling you what’s up, but so is the Mercury News. Still, it’s hard to know exactly what to expect for every one of the shows. Here are my guesses. Note that on every night, each show is a separate paid admission. Thurs., Aug. 26, 8:00 p.m. — Duo with Terry Riley. Riley’s music is Hindustani influnced (check out that link), he wrote “In C,” and his piano playing is full of complex polyrhythms that my ears can’t catch. Even so, on the In Lisbon CD that I own, Riley comes across as quite jazzy — in a tangled, multilayered way. This might not be as noise-driven as some would think. Thurs., Aug. 26, 10:00 p.m. — Trio with Mike Patton and Fred Frith. Yeahhhh… that one’s gonna be noisy. Fri., Aug. 27, 8:00 p.m. — Alhambra Love Songs, performed by Rob Burger (piano), Trevor Dunn (bass), and Kenny Wolleson (drums). Zorn isn’t performing. All three are former Bay Area residents, appropriately playing songs devoted to the Bay Area. I haven’t heard the album, but reviews — like this one from Route 66 SL, describe it as nice piano jazz. Fri., Aug. 28, 10:00 p.m. — Aleph Trio, performing a soundtrack to a Wallace Berman movie, played by Zorn with Dunn and Wolleson. Normally, I’d expect another melodic set, but Berman’s film, a personal project compiled over more than 10 years and not officially released, sounds like grounds for something edgier. Go back to that Merc article for a more apt description. This sounds like a good one for jaded Zorn fans who’d like to be surprised. Sat., Aug. 29, 8:00 p.m. — Zorn and ROVA. Great free improvisation. ROVA are all longtime Zorn friends, and they share his love of developing new improvisational structures and rules — game pieces and graphic scores being part of ROVA’s playbook. I’m expecting game pieces here — lots of hand gestures, lots of extended improv. Should be fantastic. Sat., Aug. 29, 10:00 p.m. — Cobra. This is Zorn’s most famous game piece, a directed free improvisation where a conductor uses hand signals and preprinted signs to direct a large group. But within the group, members can break off into guerilla tribes, starting their own things or deliberately messing with the group structure. Cobra recordings exist, but you really have to see it live. There’s a lot of action to watch, and the results can be downright funny. Instructions given to the players can include a command to remember what they’re doing, so they can be told to reprise it later — or a command for everybody, in order, to play/screech/scream one note. The 15-member band is ridiculously stacked. This is the most likely show to sell out, if it hasn’t already. It’s also the most expensive, at $35. I don’t know a lot about the artists being featured at this year’s San Francisco Electronic Music Festival. But the poster is pretty damn cool, don’t you think? After 10 years of doing this, the SFEMF has built up an impressive roster of artists who’ve performed. Not that the sine waves and staticky sounds aren’t cool. I do appreciate some of the stark, mathematical sounds that come from the sine wave camp, and the louder, staticky stuff can be fun to experience. 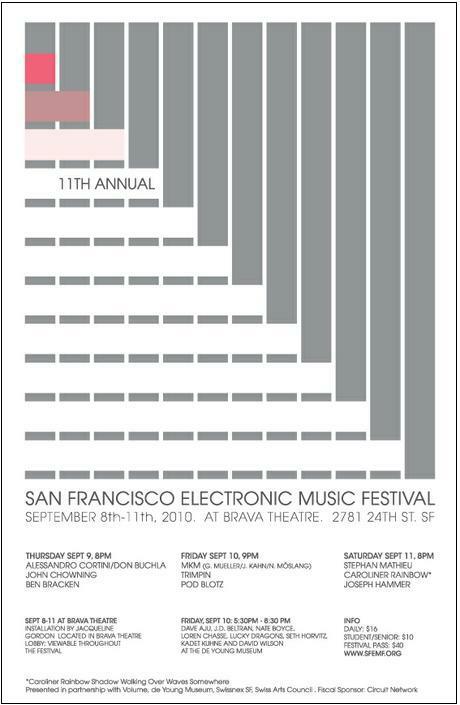 The SF Electronic Music Festival happens Sept. 9-11 at Brava Theater, San Francisco. There’s an accompanying installation that opens Sept. 8 at Brava, and a related event at the de Young Museum on Sept. 10. During the big gap in blog entries this past month, I went to Ashland, Oregon, for the family’s annual trek to the Oregon Shakespeare Festival. I don’t normally write about it here because it’s obviously not a music trip. But director Bill Rauch, in the program notes, quotes from a literary analysis that says Hamlet could be considered Shakespeare’s most avant-garde play. They’ve delivered on that premise, and the results are electric. Dan Donohue recites Hamlet’s lines in a contemporary patter. His technique, in past years, has involved a more American lilt and a casual style of reciting lines, as if to create a more conversational Bard by changing the delivery and the timing, but not the syntax. The result feels very modern (the use of modern dress helps) and fresh — and alive. There are spots in the first act when it feels like Donohue overdoes it, but what’s important is that he maintains an intensity throughout. Hamlet opens the play bitter and hostile — not brooding in a corner, as you sometimes see him — and his descent into madness felt steeper and faster than usual. This perpetual energy keeps the momentum building. Hamlet is the longest play in the canon, but this version’s three hours and 15 minutes zip by. When the scenes leading up to the climactic duel start to unfold, you get the sense of an unstoppable snowball, of events beyond any one character’s control. But here’s the best part: They nailed the ending. Certainly there are a lot of elements to like. Other reviews focus on the use of sign language or the hip-hop break (it’s gratuitous but not as groanworthy as you’d think). The ensemble is captivating (Richard Elmore makes Polonius funny and even likeable). There are some major twists, made without changing the dialogue — Gertrude, in particular, gets a very interesting interpretation. All those elements, and Donohue’s crack performance, are fine on their own, but they really pay off as a setup to the last 10 minutes. And likewise, the finale wouldn’t mean anything if you hadn’t taken the full journey with the characters. It adds up to a Hamlet that’s deeply satisfying and feels more complete than usual. Daniel Fuller has written an illuminating piece on Wu Fei for ALARM Press. She openly discusses the self-doubts that hovered around her during her education, including an uncertain first semester at Mills College. I discovered Wu Fei’s debut CD, A Distant Youth (Forrest Hill, 2007), during a rare visit to Downtown Music Gallery. They had a whole box of them opened up, making it look like a CD they were taking seriously, and because I always try to make a discovery when I visit a store, I took a peek. Fred Frith and Carla Kihlstedt were listed on the back. I’d heard Miya Masaoka’s avant-garde koto work, and the guzheng seemed like it could offer a new take on similar territory. I took the plunge. What’s surprising is the depth of traditional influence on the album, with lots of harplike sweeps and very Asian motifs. But it’s got the innovative side you’d expect, as well. “Diao Chan” is very much Frith territory, dark and noisy, with industrial guitar ringing like giant springs dropped, and Kihlstedt spinning darkly lyrical melodies. The closing track, “Break Away,” has a happy-go-lucky air, with lots of bubbly guitar that starts out folky and gets into some catchy if avant-garde twanging. I have not heard her album Yuan, on Tzadik, which includes other traditional Chinese instruments but also a solo piece for piano. If you’ve got any thoughts on what that one sounds like, feel free to leave a comment below. Hat tip: Avant Music News. Here’s a spirited session made up of Skirl regulars. 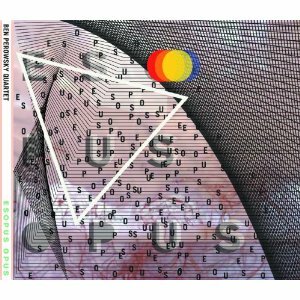 Ted Reichman (accordion) and label owner Chris Speed (sax/clarinet) define the sound, but Perowsky (drums) has the controls, putting solid beats behind some upbeat compositions. “Present Distance” stands out for the pulsing accordion that sets the rhythm, with Speed playing some bright, razzing sax. A solo section later on has Speed moving more freely alongside Drew Gress (bass), with Perosky pounding away. I do appreciate the airy, languid motif that’s been in Speed’s and Skirl’s work (The Clarinets comes to mind), but the fire of Perowsky’s drums throughout the album is a treat. Beatle covers usually leave me cold, but”Within You Without You,” with the accordion replicating a sitar drone, works well. It’s also the kind of languid atmosphere that Speed revels in, weaving clarinet lines around and through the fabric of the tone. “Flying,” the lone ’60s track credited to all four Beatles, is a quirky choice for a cover; it’s inserted like a bit of an in-joke and is kept appropriately short. Perowsky also adds a spirited cover of Hendrix’s “Manic Depression,” with a catchy pulsing accordion setting up a jovial, carnival-like air. I like it. Perowsky likes his traditional jazz, too. “Keylime” is a bluesy, brazen opening. “Murnau on the Bayou” is an outright swampy New Orleans drag, deliciously slow and rich with old-timey jazz flavor. I really liked the title track, a short, poking, cutesy composition. The album closes with its most somber number, “Red Hook,” which confines Gress to a bass pulse that sets up a pleasant yet slightly unsettling sax/accordion melody.